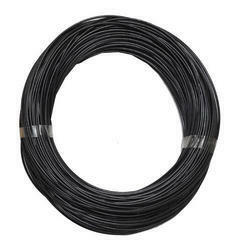 Offering you a complete choice of products which include drip tape, garden irrigation, micro tube - 1.2 mm, micro tube - 1.5 mm, micro tube - 2.0 mm and micro tube - 2.5 mm. Drip Tape are developed from special grade virgin poly ethylene mixture. Its is Low cost drip laterals and it is seamless tubes and We also manufacture screen filters , Venturi and Connectors. 4. Inner diameter – 16 mm ( 5/8 inch ). 7. Drip holes are formed in the tape with spacing of 12 inch, 18 inch, 24 inch, 30 inch. Customized drip hole spacing can be manufactured. 8. Discharge rate is approximately 8 litre per hour. 9. Drip tape is meant for above ground laying. It can not be used in sub surface. 10.It comes in roll packing of 10 kg. Packaging Details: Drip Tape is 10 kg roll packed. Length per roll of 10 kg is approximately 900 metres. 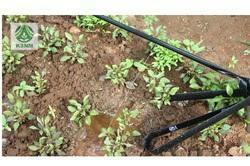 Garden irrigation is very simple and affordable by small farmers and it is very easy to use in the field. This drip Tape is used in a variety of crops. This Garden irrigation allows you to control how much water your plant will receive. It will reduce water consumption and increase crop quality. 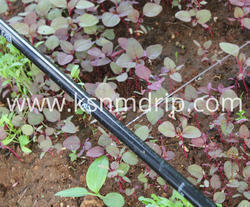 This Garden irrigation can be used for all closely spaced crops. Micro Tube can be inserted in plain drip line after making a small hole for inserting the micro tube. It can work well under gravity irrigation. Hence can be used alongwith drum kit, home garden kit. For terrace garden with grow bags, micro tube is used extensively. Micro Tube can be inserted into cylindrical drip tube for tree irrigation.